The Diamabrush Mastic Removal Tool is now called the coatings removal tool. There are two versions, a 6 blade and a 10 blade. Don’t let the name fool you, it does a whole lot more than just remove your old floor coatings. Like our Concrete Prep Plus tool, the coatings removal tool attached to equipment you can commonly find at rental stores. Most homeowners and contractors that are renting equipment prefer the 16″ 25 Grit CCW (counter-clockwise) 10 blade tool. It makes efficient work of both removing the old coating and preparing the surface below for epoxy coatings. If you are using a thin build system, check with the supplier for grid recommendations. We do offer a loaner 16″ 10 Blade CCW for customers using our coatings products. You will receive a full refund, less $100 to cover shipping costs in both directions and blade replacement / maintenance. This tool is common for preparing coated concrete. 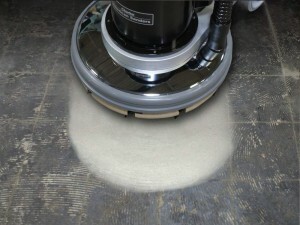 It removes old coatings and grinds the surface in one easy step. Most customers need the 16 inch tool to go with a 17 inch CCW Buffer or sander BUT you need to verify your needs before placing your order. 10 Blade tool shown.